SupraCare enables organisations to manage individual patient or client plans, organise work processes, and make data-driven decisions to increase efficiency and drive up the quality and safety of care. The highly flexible and configurable system is based on a web application, designed to plan and monitor daily work in an organisation; and a tablet application placed in multiple locations across the organisation to be used by staff to check, monitor and record completion of scheduled activities. The first step is to diagnose the needs and preferences of patients or clients and then create an Individual Care Plan (ICP). Alongside the ICP, the organisation produces a Roster – setting staff working hours and competencies. The system then collects all the tasks from the ICPs and creates a work schedule for the next day by matching the tasks against rostered employees. The automatic scheduling module is based on more than 50 mathematical algorithms and rules to ensure that the work management is efficient, and the work schedule is optimal. The staff member then checks their work plan using the tablet application and is able to record activity against any assigned task or select a reason why the task was not performed. 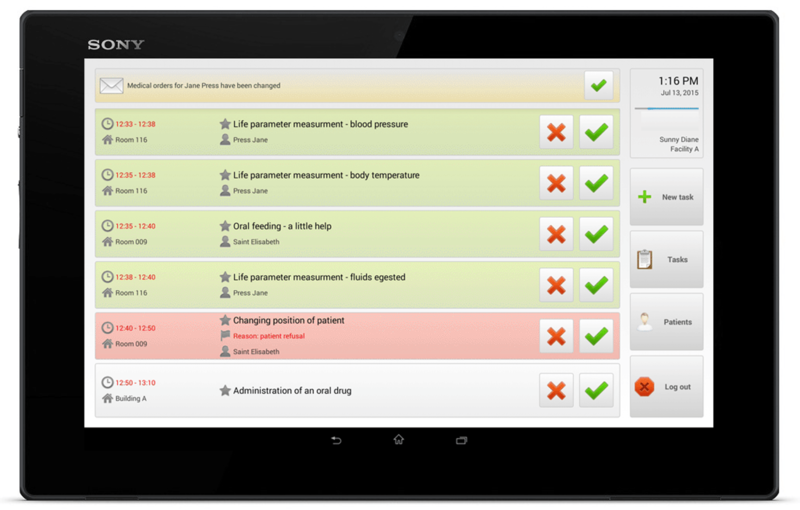 The Care Manager then monitors real-time staff activity across the organisation using the web-based application. They are able to see the status of each task and can supervise many employees at the same time. By notifying the manager about unperformed tasks, the system allows them to react quickly when a planned task is not performed. Status of the preliminary examination (if applicable). Preliminary examination may include various areas, depending on the specialisation of the facility, for example: nursing, rehabilitation or mental health. These defined areas are flexible and determined by the organisation. The Individual Care Plan (ICP) is a list of well-defined tasks planned for each patient or client. The ICP is based on the first assessment with the patient or client and their family, medical assessments, care and rehabilitation plan, as well as patient or client preferences, therapeutic and social needs. The tasks which form the ICP can be added one by one from the list of more than 300 tasks already defined in the system. Alternatively, there are Care Schemes available in the system that can be selected and later adjusted to meet individual needs and preferences. Each task has defined parameters such as: optimal duration, priority, starting time, required frequency and staff competency. The parameters of all the tasks are based on practical experience from organisations already using the system. The list of tasks and their parameters are fully customisable. 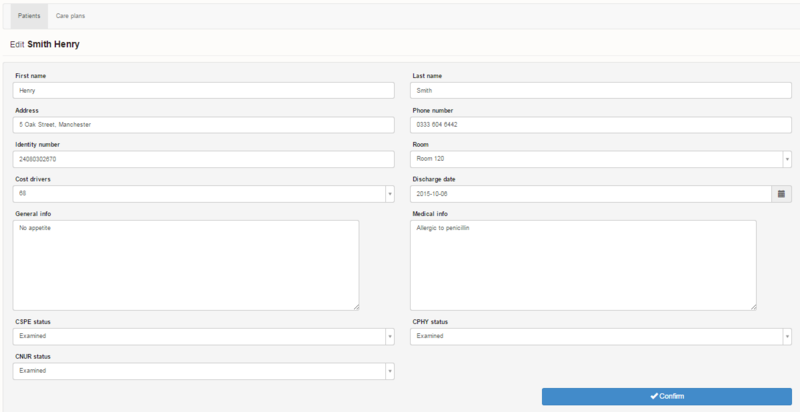 The Rosters module is designed to organise employees’ duty hours. In addition, the system can determine whether the employee will perform tasks across the facility or on certain floors or wards/units. The system facilitates the duties’ planning process by providing information about the number of employees with different competencies that are on duty during that day or night. With the Dictionary module, the system can map all the processes that are occurring in the organisation. It includes information related to the infrastructure of the organisation (rooms and floors configuration), calendar (planned holidays) as well as the staff competency (roles and responsibilities). During the implementation phase of the system, after analysing the business processes of the organisation, we define the required information so that work management will be efficient and the work schedule will be optimal. For example, with the information from this section [infrastructure – visible on screenshots], the system knows how to group activities in different parts of the facility to minimise the distance covered by the personnel while performing their tasks, or how to assign tasks to employees to minimise labour costs. The work schedule is created as a result of the automatic planning. The system collects all the tasks from the ICPs and assigns staff to perform them by taking into account all the parameters of the activities (duration, priority, linkages etc. ), staff (availability, competencies, roles etc.) and patient or client (availability, preferences etc. ), and at the same time following more than 50 optimisation rules. 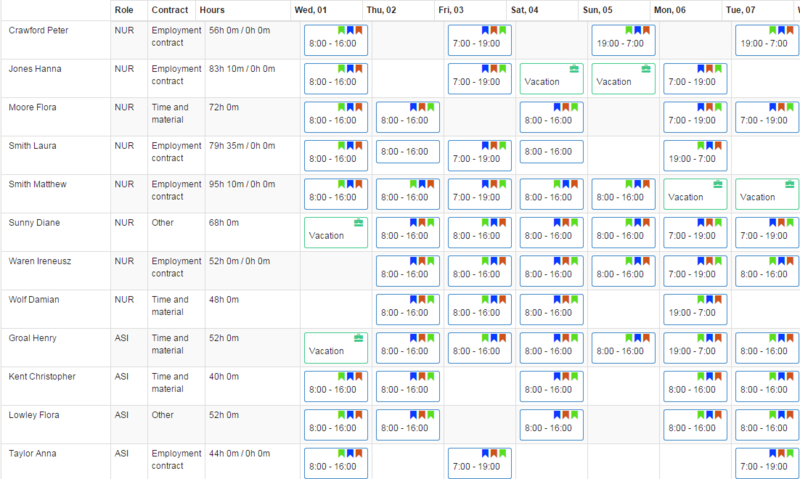 The generated tasks are presented graphically in the Schedule module. 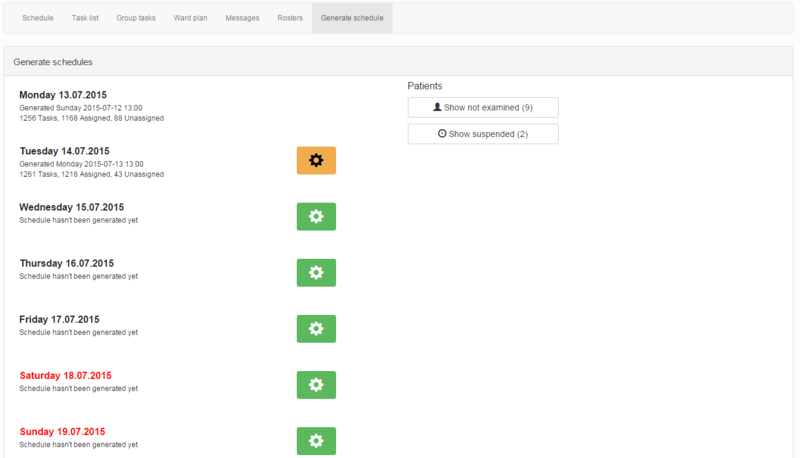 The Schedule module allows the Care Manager to monitor and control the execution of tasks. The system also notifies them about unperformed tasks, enabling them to rapidly diagnose the situation and respond to it. The work schedule is created as a result of the automatic planning. The system collects all the activities from the Individual Care Plans and assigns staff to perform them by taking into account all the parameters of the activities (duration, priority, linkages etc. ), staff (availability, competencies, roles etc.) and patient/client (availability, preferences etc. ), and at the same time following more than 50 optimisation rules. The staff member check their work plan using the mobile application available on the tablets placed in different parts of the facility. The staff member then records activity against each assigned task; in respect of medical tasks, they also provide medical results such as temperature, pressure, blood glucose levels. Follow-up protocols are automatically initiated by the system if reported medical results are out of norm. If the employee is not able to perform a task, they select a reason why the task was not performed (lack of time, performed by the family, patient refusal, etc. ), and the system will notify the Care Manager about it. Depending on the situation, the Care Manager decides whether the task needs to be performed at a later time by this or another staff member. Each performed and assigned task is registered in the system. Collecting such detailed data provides huge analytical potential, leading to accurate diagnosis and enables organisations to make data driven decisions. With the data collected in SupraCare, for the first time organisations can answer the questions that are essential to make patient or client care more effective: How much time does the care for each patient or client take? What is the cost of care for each patient or client? Which staff member performed most of the tasks? Which staff member performed least of the tasks? Could the scheduled tasks be performed by a smaller number of employees? Could staff perform more tasks at their duty? The answers to these and other questions can be found using the Reports module. All of these and related elements affect both the service quality and an organisation’s economic efficiency. Full and straightforward information is essential in order to make the necessary changes as well as to respond quickly to adverse clinical and management events. Reports can be extracted for any period of time. For example, while looking for information about activities not performed, we can ask the following question: What activities weren’t performed? What were the reasons for not performing them? Which staff member did not perform the activities? Which patient or client refused the activity? By asking these and other modified questions, organisations can identify any problems and determine solutions. Data driven decisions lead to higher efficiency, better quality of care and increased patient/client safety. An average long-term care facility with 100 patients would generate 1,500 tasks daily, that’s 550,000 per annum. All of these tasks – and their subsequent activity – are recorded in the system. Effective planning of such a large number of tasks requires the support of IT tools. In SupraCare, the work planning process is based on more than 50 rules that reduce costs and maximise staff productivity. Staff costs account for up to 70% of all the costs in LTC facilities and time management of staff has a direct impact on the financial efficiency of the organisation. Our system makes it easier to organise duties and to adjust employees’ rotas to the tasks arising from the needs of patients or clients. A high quality of care is achieved through the individual approach to the needs of each patient. That’s why the first step is to create an Individual Care Plan. Patients’ needs and preferences are taken into account every time the work schedule for the next day is created. The system enables organisations to combine individual and time-varying patient or client needs with efficient work organisation. Changes in patient or client needs and preferences, change of staff rotas, or sudden interventions can have a significant impact on the effective running of an organisation as well as the quality of care and patient or client safety. Change management functions have been co-designed with organisations using the system in practice – in such a way that the impact of the changes on the continuity of work is minimised and quality and safety is ensured. Theability to check the work schedule on the tablet makes the task communication clear, unambiguous and effective. Moreover, the message module allows for additional communication (unforeseen events, recommendations, etc.) with all or selected employees. The system continually identifies unperformed tasks and enables the Care Manager to respond quickly thus ensuring and increasing patient safety. In addition, each medical activity in the system has established norms – follow-up protocols are automatically initiated by the system if reported medical results are out of norm. The SupraCare system was designed in line with the best practices of managing long-term care facilities and is based on intensive work with a number of organisations to test and develop the system. The optimal duration, priority, and the requirements for staff were defined for more than 300 tasks, facilitating the standardisation and benchmarking of facilities. 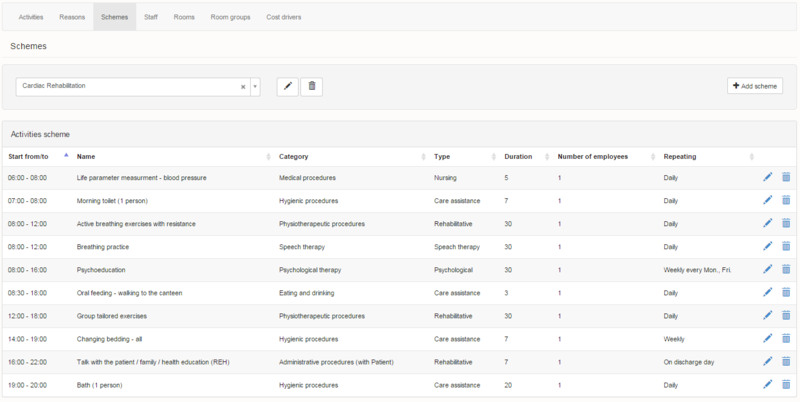 The system provides templates to help organisations create Individual Care Plans for patients or clients. The list of Key Performance Indicators defines areas to be monitored that have a direct impact on the economic efficiency of the facility. The know-how contained in the system increases the work efficiency of already operating facilities and shortens the learning curve for new facilities, their managers and employees. Due to sophisticated work reporting, the system gives organisations access to data that hasn’t previously been available in long-term care or other facilities. For the first time, data is collected at patient or client – and employee level – making detailed and precise analysis possible on queries such as: How much time does the care for the patient or client take? What is the cost of care for each patient or client? How many tasks are performed by an employee? What is the availability/occupancy of each employee? The system allows you to find precise answers to these and other key questions, and enables data driven decisions that lead to higher efficiency, better quality of care and increased patient safety. The most cost effective way to utilise SupraCare is using our hosted service. The organisation doesn’t then have to worry about the purchase of servers, running data backups or technical support. The price of the system is based on a monthly hosted fee and one-off implementation fee. The licence fee depends on the number of employees accessing the system. Please get in touch with us to discuss costs. How much does SupraCare cost? The hosting fee depends on the number of employees accessing the system. There is a one-off implementation fee together with a one-off fee to purchase the number of tablets required. How long does it take to implement SupraCare? SupraCare configuration takes about two weeks. Standard user training includes 26 hours of training, to be split between the system administrator, Care Managers and staff members. The Care Managers participate in four training sessions spread over time so they have enough time for practical exercises between sessions and can learn the system step-by-step. SupraCare is easy to use and requires only minimum training. Staff members use the intuitive mobile application installed on the tablets which doesn’t require any computer skills, and the SupraCare mobile application training takes only one hour. The web application training is broken down into several sessions in order to allow the Care Managers and the system administrator to gradually understand and use SupraCare. The pace of the training and intervals between sessions devoted to practical exercises, are tailored to the computer skills of the Care Managers and system administrator. What’s the difference between consultancy and training? Standard user training includes 26 hours of training. We provide it to familiarise staff members with SupraCare and how it works. Bespoke consultancy is an additional service provided by itCraft for the Care Managers willing to improve operational efficiency of their organisations on the basis of data collected in SupraCare, best practices in long-term care and itCraft proven solutions. Based on our analysis, we diagnose the problem, identify areas for optimisation and present practical recommendations. The delivered reports are not an end in itself, but rather a starting point to develop practical solutions with a measurable positive impact on the efficiency of the organisation. What happens if we lose our internet connection? If the lack of connectivity is temporary, the system will automatically connect to the Internet as soon as it is possible – there is no need to restart the application or the tablets. If the lack of connectivity continues, it is possible to use the work plans stored in the Excel file. SupraCare Support team makes sure this file is available in a situation such as this. How many computers and tablets do we need? SupraCare is hosted on servers that meet the highest requirements for data security, IT infrastructure and programming tools. Data is backed-up every night, in order to further increase its security. Each facility has its own database scheme, and a high-performance server for the application. Can the system be configured for our particular business needs? SupraCare is composed of modules and is highly flexible and fully configurable. During the implementation process, we analyse the business needs and processes of the organisation in order to adjust various functions of the system to the particular client. 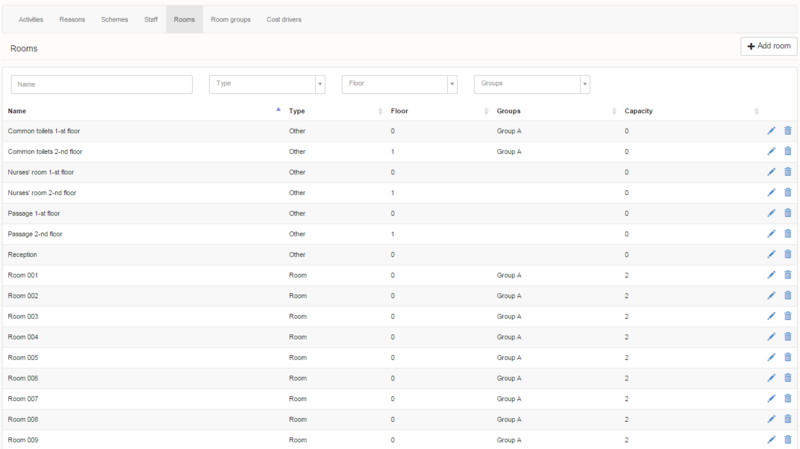 We map the physical infrastructure of the organisation in the system – floors, rooms, number of beds. We adjust the list of activities that are carried out in the given facility and we add all new activities identified during our initial analysis. We define the roles and responsibilities of staff in the system, so they match their current work mode and responsibilities. Can't find the questions you are looking for?